OCEANSIDE — Remember Our Fallen traveling memorial made a five-day stop in Oceanside Feb. 9 to Feb. 14. What uniquely stands out about the memorial are the personal photos and stories of each California man and woman who died in combat since 9-11. Each soldier is pictured in uniform, and in a second photo holding his or her child, or wearing his or her high school sports uniform. There are also mementos and letters left by family and friends that continue to travel with the exhibit. The California memorial has photos of over 700 soldiers. It filled the ballroom of the Veterans Association of North County (VANC) in Oceanside. Sandra Silva Fichter, VANC vice president, said some visitors came back a second day to take it all in. To date Remember Our Fallen memorials are completed for 15 states. Currently each memorial travels within its home state. Future plans are for all 50 continental states memorials to travel together as one exhibit. The idea for the memorial exhibit started four years ago when Bill and Evonne Williams were moved by a newspaper article in which a Nebraskan father of a fallen solider said he was sad that people would forget his son, and the war was not even over. This inspired the Williams, who have four sons in the military two serving in the Army and two serving in the Marines, to create a memorial of Nebraska fallen soldiers. They researched, contacted each family for photos, and opened the exhibit. The impact of the memorial led them to begin researching other states. To date California, Alabama, Arizona, Colorado, Florida, Georgia, Iowa, Kansas, Missouri, Nebraska, North Dakota, Oklahoma, South Carolina, Texas, and Wisconsin memorials are completed, and recent fallen soldiers in those states continue to be added. Patriotic Productions nonprofit was founded and has grown to over a dozen volunteers who transport the exhibits and book host sites. Tom Williams, son of Bill and Evonne and an active duty Marine based in Camp Pendleton, transports and sets up the California memorial. Tom said the 50 states memorial is halfway completed with the states of California, Texas and Florida, which have large military populations, done. Research is underway on the remaining states, and is still personally conducted by Bill and Evonne Williams. “They contact families through letters, social media, phone books,” Tom Williams said. “There’s no (state) order. It just depends on how fast they get it done. Tom shared heart-warming stories of personal connections his parents have made with the families they contacted. One was a phone call his mother made in which she addressed the caller as Ashton’s mom. The women was moved to tears and said she hadn’t been called Ashton’s mom in a long time. The goal is to have all 50 memorials completed by 2016, and hold the first 50 states exhibit in Washington, D.C.
Funding for Remember Our Fallen memorial comes from sponsorships and donations. Organizations that host the memorial make a donation to help cover the costs of transport and set up. Additional contributions go towards research and construction of future memorials. Bellevue University displayed the first memorial exhibit and is a major sponsor. 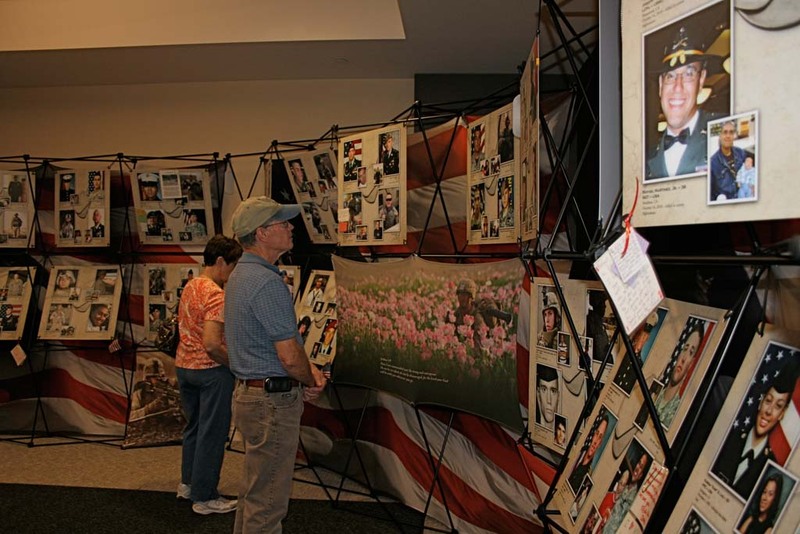 For more information and state-by-state exhibit schedules go to rememberingourfallen.org.